With over 800 million active users, Instagram is undoubtedly one of the most far-reaching social media networks you can use for marketing purposes. Instagram has proven a viable advertising option for businesses today, and shows no signs of slowing down — in fact, eMarketer estimates worldwide Instagram ad revenues will exceed $10 billion by 2019, an exponential increase from 1.86 billion in 2016. If you’re not already using Instagram for your business, you’re missing out on a ton of opportunity to grow brand awareness and reach a wide audience. Fortunately, adopting an Instagram strategy can be relatively easy with enough time and effort. However, if you’ve never used the app, you might be daunted by the first question likely to cross your mind — How can I post my first image? If you’re ready to post an image to Instagram, we’ve got you covered. Here, we’ve cultivated a quick-and-easy guide to posting on Instagram, to ensure you can begin attracting some of those 800 million users today. 1. Open the Instagram app. Click the “+” icon at the bottom of your screen. 2. 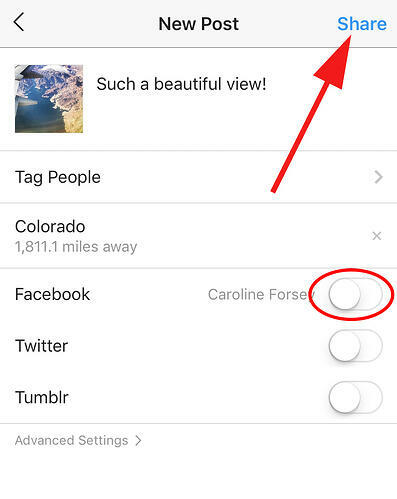 Instagram will show you the photos already saved to your phone. Choose one of those to post. Alternatively, you can click “Photo” or “Video” in the bottom to take a photo or video within the Instagram app itself, if you don’t already have an image you want to use. Once you choose an image, click “Next” in the top right. 3. Instagram offers 25 filters — scroll to the right to peruse your options, and click on one to preview how it will look on your photo. (Take a look at our Ultimate Guide to Instagram Filters to learn more). You can click “Edit” at the bottom right to adjust contrast, brightness, etc. When you’re ready, click “Next” in the top right. 4. In the text box at the top, type your caption. Additionally, you can click “Tag People” to tag other Instagram accounts in your post, and “Add Location” to put a location on your image (which makes it easier for people to find your post). Finally, if you want to share your content on your other, connected social media sites (like Facebook or Twitter), simply slide the bar from the left to the right. When you’re ready to post, click “Share” in the top right. How to Use Instagram: A Beginner’s Guide.